From the antlers of a stag. It used to be a source of ammonia, and was used in the production of smelling salts. In England hartshorn was used in the 17th and 18th century to make jelly. It was also used as a rising agent under the name of baker’s ammonia (or ammonium carbonate). Recipe: Tasty hedgehogs. A typically Dutch sweet, individually packed in a paper wrapper (see picture). This candy was created at the end of the 18th century by a confectioner in The Hague. In an appartment above his shop lived a former diplomat, Baron Hendrik Hop (1723-1808). The baron loved to drink coffee, which he drank with cream and sugar. One night he left his coffee on the stove, and when he rose in the morning he discovered that the coffee had thickened into lumps, which actually tasted very good. When his physician advised him to abstain from drinking coffee, the ingenious baron asked his neighbour to recreate the coffee chunks. These ‘chunks of Baron Hop’ immediately became very popular, they were even exported to the court of the Russian Czar. 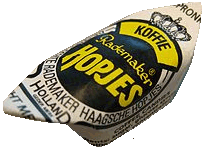 Hopjes are made with burnt sugar, coffee, butter and cream (source: the Dutch Wikipedia). Recipe: Hopjes custard. A small shrub with tiny purple flowers, Hyssopus officinalis. You can grow it easily in your own garden. The taste of the leaves resembles thyme. 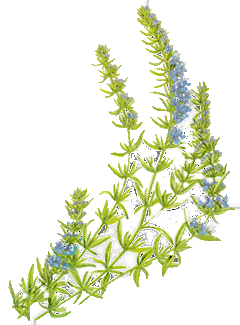 The plant originates from the Middle East and the Mediterranean, where it was a kitchen herb in classic times. The taste is rather dominant, use it sparingly. According to Alan Davidson (The Oxford Companion to Food) hyssop helps the digestion of fat, which makes it a very good herb in fatty meat dishes. Recipes: Medieval Xmas goose, Soupe Jacobine, Medieval stuffed chicken.